in energy and building materials costs has your attention. while building with better quality? How much would have to give up to meet these goals? 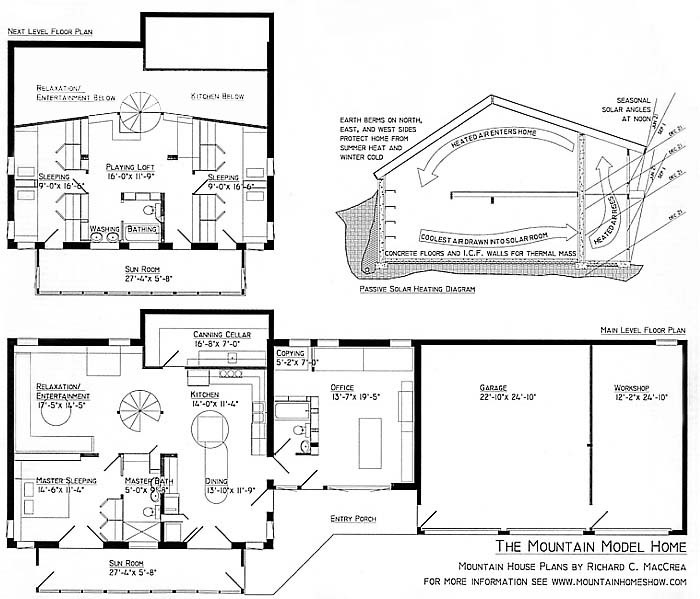 a model home designed for the mountains. economical construction, and environmental conservation. natural materials with modern design. and came up with some unique ideas of our own. For energy efficiency we provided a solar space. The low winter sun heats up this two story glass room. drawing the warmth through the entire home. through every room before returning to the solarium. (A web page showing information and photos of these walls). We will also save energy with high quality windows. near the peak of the high ceiling to let out the heat. of the home. Many homes have a lot of wasted space. to save space without making it feel small. We decided to build in the furniture. We also used built in shelving for many of the walls. This allowed us to eliminate more of the furniture. much of it from the trees we cleared for the home. we purchased tools to make our own. we chose acid stained concrete. mountains being ruined by poorly designed homes. can afford to splurge in this area because it is small. to the living space and provides a beautiful view. was kept to a minimum to prevent erosion. filled and provide water for the plants. with homemade lime plaster tinted with ochre. less costly, more durable, and more beautiful. So we put the emphasis on the living areas. very energy efficient, and earth friendly. this home better, more livable, and more beautiful. Make an appointment with Richard C. MacCrea.